Here is the presentation showing a tremendous performance of our best recommendations in the past year. Is this really for the first time that market has shown such amazing indices? Sensex closed near to the all-time high, i.e., 29910 points, on April 03, 2017, and that was the biggest surprise for the market of course. The experts are of the view that market will be showing positive signs of growth this new financial year and will surely empower the economy to lead towards greater opportunities. This shows that Sensex has proclaimed its previous high after two years. Accordingly, Sensex took completely two years to come on the same track again in 2017. With this, we can understand that the growth of Sensex in the past two years was zero percent. When in 2015, it reached its all-time high, it would have been expected that it will further move higher and perform tremendously providing growth to the economy as a whole. But gradually, it was noticed that it fall off and now in 2017 has reached up to the same level again. What we need to know is that with this 0% growth in Sensex how investors earn profits. Were their investments in losses? Or gained little benefits just to reach the equilibrium? 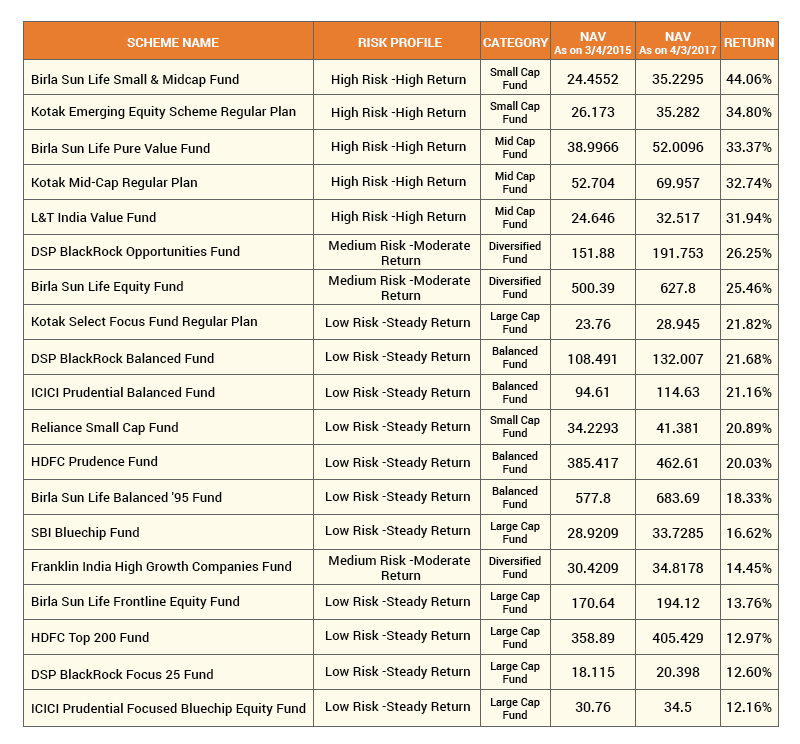 Mutual funds showed some better than this! You must be wondering why we are telling you all this. We just want to make it clear that mutual fund investments are though subject to market risk if made with the best-performing funds can beat the worst market conditions as well. The table shown below will help you in getting what we are trying to convey here. The table above depicts the funds that our fund advisors recommended to the investors in 2016, which showed tremendous profits. When Sensex was struggling to proclaim its all-time high, our best recommended mutual funds were doing their job of offering greater returns. The funds are among different categories which include large-cap, small- and mid-cap equity funds, diversified funds, and balanced fund schemes, having different risk profiles. The small- and mid-cap funds were the top performers among the various plans, and instead of growth stocks, the value investing funds showcased attractive performances. You will notice the funds that are included in our recommendations performed effectively. The indices for large-cap stocks are back to their previous position now, but irrespective of the market performances, the large-cap funds which were suggested by our experts beat their benchmarks in these two years with very high margins. Even the stock market was not outperforming; the conservative investors also gained huge profits with balanced fund investments which are expected to yield good profits only when the market offers significance return opportunities. They not only earned expected returns but many a time the returns were even higher than those offered by the pure equity mutual funds in the market. Our experts’ recommendations have been proved effective with this data provided here. It is often said that mutual funds are risky, and their returns shrink when the market goes down, but the funds suggested by our fund analysts performed in efficiently even in the falling market and offered more than the expected returns. So, it is not the matter of selecting the fund for investment; it is all about making the best choice. MySIPonline provides the best platform for making a worthwhile investment in the mutual funds. The top-recommended funds available on our website are highly researched and ensure high returns even in the market down. So are you ready to build a highly-productive portfolio for your investment? Start investing in the best-performing mutual funds in India now.